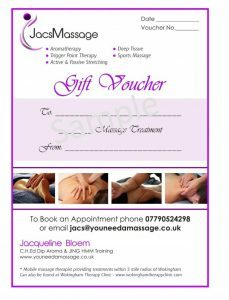 Jacqui is a qualified massage therapist with over 13 years of experience practicing both in the UK and abroad. She specialises in deep tissue, sports and remedial massage. Her training and qualifications, combined with years of experience, give her the ability to provide unique massage treatments appropriate to each client’s individual needs. She has a strong understanding of the importance of health and wellbeing and firmly believes in the importance of maintaining a healthy mind, body and spirit. She is friendly, down to earth, professional and passionate about complementary health and massage. Jacqui is a member of the National Association of Massage and Manipulative Therapies (http://www.nammt.co.uk/), this keeps her up to date with the latest developments in massage therapy. She is also listed in the Therapy Directory where expert articles, recent up to date news on complementary therapies and local events are always posted. "I work with clients of all ages with a range of musculoskeletal issues, health challenges and emotional issues. I love the challenges that this brings me every day. The results I get from my clients brings me an enormous amount of satisfaction. I honestly believe that everyone can benefit from massage!"